Mark recounts a gripping incident entailing a perfect storm that resulted in the participants sailing through troubled waters unscathed. These verses are golden in the wealth of lessons they contain. Keep in mind as we visit together today the words “sailing through”. In other words, just as Christ’s disciples, we will not stay stuck in the storm—we are experiencing a passage. But, you might question, how can a storm that brings pain, loss, and despair be perfect? Ah read on. First—When the Lord climbed in that boat with his friends, He already knew what was going to happen. He knew the purpose for letting them experience terror and panic. He needed them to witness not only His miraculous power which would help convince them He truly was God’s Son. But He also needed them to learn to trust Him implicitly and as well they needed a lesson in asking and receiving. He knew exactly how He was going to keep the disciples safe. 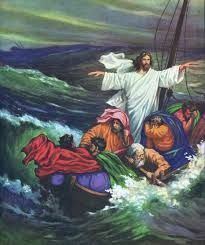 And true to Christ’s compassionate and loving nature, He stayed in the boat with them through the entire episode. Jesus allows storms to penetrate our lives but not only does He know the tumult is on its way long before the threatening clouds appear, He also knows the purpose—there is always a purpose. Sometimes we see it clearly and sometimes we may never understand why. But know with every fibre of your being—there is always a purpose and it behooves us to trustingly accept these situations as coming from Him. He already has a deliverance plan—a calming plan to keep us safe just as he did in that boat on the Sea of Galilee centuries ago. As the disciples asked for His divine intervention, so must we confidently take our tribulations to Him. He will enfold us in His protective, shielding arms throughout the entire frightening ordeal. Jesus will calm the storms of life when the time is right and before we are washed away and overwhelmed by the intensity. I love that the passage says a “great” calm—not just a calm but a great one. The Lord does not do things small!! Sometimes a part of Jesus’ storm calming technique is saying to us as we weepingly cry out in anguish “hush now—be still.” The quieting of our storms is not always to our expectations and in alignment with our definition but when we utter a heartfelt request a great calm enters our hearts. Third—The Scripture says “a perfect peacefulness” came to them. Perfect peace because they were touched by the Perfect Christ; perfect peace because there was nothing missing; perfect peace because it was imparted by the Perfect Savior. Oh precious reader “perfect peacefulness” is ours to grab. Turbulent times make us agitated and we complain and cry out against God. We question why and doubt His presence in our lives. But we must rely on Jesus when He says, “Hush now—be still and know that I am God” that He is working His plan. When Jesus is presiding over our souls the storm is perfectly planned and executed and it produces perfect peace. Dear friend know this in your deepest being—any storm that God allows is perfect and we can be assured that “a perfect peacefulness” will settle down over us. And know the loving Master will be with us in our tossing boat the entire journey as we sail through those troubled waters.